Kansas’ Silvio De Sousa celebrates by cutting down the net after the Jayhawks defeated Duke 85-81 in overtime in a regional final game in the NCAA men’s college basketball tournament Sunday in Omaha. OMAHA, Neb. (AP) — Kansas is going back to the Final Four. It’s hard to argue that Duke shouldn’t be headed there as well after the most riveting show of the NCAA tournament. Malik Newman and the top-seeded Jayhawks got past their Elite Eight road block Sunday, knocking off second-seeded Duke 85-81 in overtime to clinch the program’s first trip to the Final Four since 2012. Newman scored all 13 of the Jayhawks’ points in OT and finished with a career-high 32 to lead Kansas (31-7). The Jayhawks will face fellow top seed Villanova on Saturday in San Antonio — the site of KU’s last title over Memphis in 2008 — after snapping a two-game losing skid in the regional finals. This was college basketball at its best, two blue bloods trading blows for 45 minutes in what was arguably the best game of March so far, one that featured 18 lead changes and 11 ties. Had Grayson Allen’s bank shot to end regulation gone half an inch in a different direction, it might be Duke heading to South Texas. But it didn’t, and instead the Jayhawks are moving on. Newman, a redshirt sophomore who came on late this season, drilled his fifth and final 3 from the corner to make it 81-78 with 1:49 left. Newman followed with four straight free throws, and the Jayhawks’ defense stiffened enough to knock the favored Blue Devils out of the tournament. Trevon Duval scored 20 points, two shy of a career high, for Duke. Freshman star and future lottery pick Marvin Bagley added 16 points and 10 rebounds in what could have been his final game for the Blue Devils (29-8), who fell shy of their first Final Four trip since winning the national title in 2015. Allen had 12 points for the Blue Devils, but the senior’s try at the regulation buzzer went in and then out and then off the rim before spinning away to force overtime. “I was trying to drive right, he cut me off. Went back left. Their big stepped into help. I had to get a shot up over him. I tried to bank it in and it about went in,” said Allen, who finished his brilliant career with 1,996 points. This might be the unlikeliest of coach Bill Self’s three Final Four squads. They are not stacked with obvious future NBA starters and they lost three times at home this season. But the Jayhawks banded together to win the Big 12’s regular season and conference titles and now the Midwest Region. By doing so, they proved to their coach that they were hardly soft — a claim that Self had made often earlier in the season. And with the final buzzer about to sound and the outcome suddenly in focus, Self clenched both of his fists and lifted his arms in the air for a celebration years in the making. The Blue Devils might see four of their freshman stars bolt for the NBA Draft, an expected exodus led by Bagley, a likely top-five pick. Duke will also lose Allen, one of the best players in school history. Don’t cry for Coach K, who has four five-star recruits committed to join the program next year. But this season will likely be remembered as a lost opportunity — and for that Allen shot that went agonizingly out of the rim. 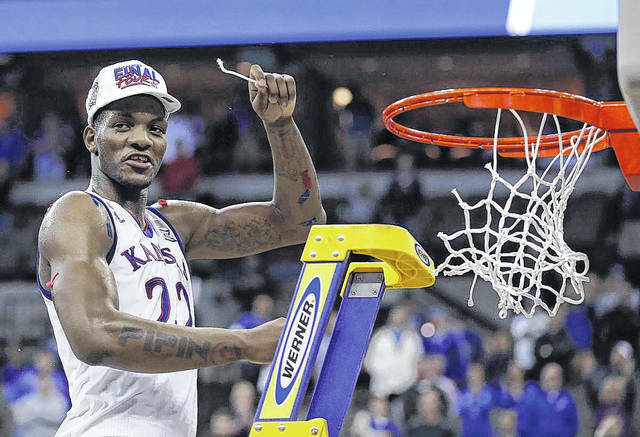 https://www.limaohio.com/wp-content/uploads/sites/54/2018/03/web1_Kansas.jpgKansas’ Silvio De Sousa celebrates by cutting down the net after the Jayhawks defeated Duke 85-81 in overtime in a regional final game in the NCAA men’s college basketball tournament Sunday in Omaha.